There are a couple of groups no one should ever tangle with online: Mommy Bloggers and Drag Queens. But, Facebook just can’t seem to help themselves in their latest fight with the latter group. Apparently, the social networking site has been threatening to shut down the profiles of drag queens until they use their legal names on their profiles. 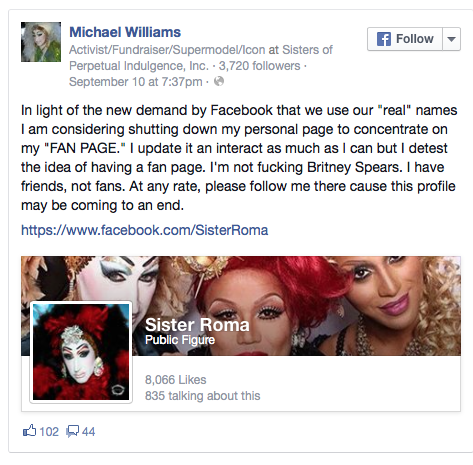 The ruckus began when Sister Roma, a widely known LGBT personality and member of the Sisters of Perpetual Indulgence, was targeted by Facebook on Wednesday for having her stage name, rather than her legal one, appear on her personal Facebook profile. IS THIS REALLY JUST ABOUT THE BENJAMINS? Sister Roma has also suggested that Facebook is doing this because they want to drive public personas to use the Fan Pages instead of personal profiles. Fan Pages require a monetary investment for updates to be seen by their following. Others have pointed out that there are plenty of fake names on Facebook and the social networking site doesn’t seem to mind. DO FAKE NAMES MAKE PEOPLE MORE SAFE ONLINE? Facebook claims this new policy is a part of their attempts to keep the site safe. And, they have been cracking down on profiles with fake names. 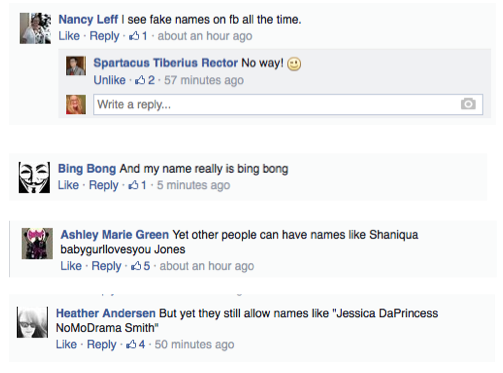 And, yet, safety may be one of the main reasons people choose to use fake names on Facebook. Some people want to engage in social networking, but they may also be trying to avoid dangerous people in their lives. And, we’ve seen plenty of stories of people being fired because of something they said on the site and even teachers being fired for posting a photo of themselves enjoying a cocktail while on vacation. IS THIS SIMPLY ABOUT DATA MINING? And, still others say this has nothing to do with keeping people safe and everything to do with data mining. After all, if Facebook is able to sell your legal name along with all the personal information they collect, you are much more valuable. IS FACEBOOK A NECESSARY UTILITY OR STILL A FUN TOOL? You might say that Facebook has the right to demand this. After all, the site is still free to use and you don’t *have* to have a FB profile. But, there is a growing movement to make Facebook a utility, much like the telephone, and therefore should be regulated. Certainly, one could argue that if you are looking for a new job and your prospective employer sees you don’t have a Facebook page, they would find that suspect. But, the more the site demands people use their real names, the more they are seeing an exodus of privacy-minded users. And, there is always the right for freedom of expression, which should allow someone to create whatever persona they want on a social networking site. As we’ve seen, the coming Generation Z is very concerned about their online privacy and tend to prefer sites and apps that allow them to engage anonymously. If Facebook continues to push users to use their legal names, one must ask will this mark the end of Facebook entirely?